"YOU can run everything on the river but the Big Foul," said the teamster at Port Jervis, as he helped us launch the canoes from a gravel bank. "Where is the Big Foul?" "Below Belvidere: you'll strike it in a few days. No boat can run that rift at this stage of the water." "Oh, it's a rift," said Moseley, standing knee-deep in the river, and packing his canoe. "I thought it was a bird. Why is it called the Big Fowl?" "It is the foulest rapid on the Delaware," answered the teamster. "I know the river to Trenton: went down last May on a fresh. You can run all the rest; but you'll have to carry round the Big Foul Rift." We had before heard about this rapid with the ominous name. A discussion in Forest and Stream , a few years ago, directed the attention of canoemen to its alleged dangers and extreme rapidity of current. 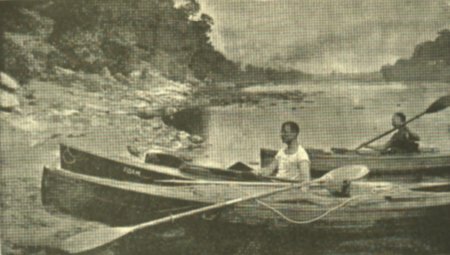 Two canoemen of East Orange, N. J., who ran the rapids in 1878, and who claimed to be the first to do it, wrote as follows: "After passing through two or three small rifts, we arrived at Great Foul Rift, which is considered the most dangerous one in the river, on account of the number of rocks and the swiftness of the current, How to describe our passage through here, we hardly know; all we can say is, we saw it, we entered it, and we passed it. You can see the big slate rocks on all sides of you, and are unable to tell what minute you will strike them. This rift is two miles long, and we passed through it in three minutes exactly, being carried that fast by the current, without using our paddles." This statement was received with astonishment. Two miles in three minutes, or forty miles an hour, is not the speed of a rapid, but almost that of a waterfall. Among the critics was Mr. A. H. Siegfried of Louisville, who had also run the Great Foul Rift. He wrote: "We were warned against Foul Rift for two days above it, and came to it determined not merely to run it, but to examine it carefully, and see if it is as dangerous as the natives think. We went through it without paddle, save for steering purposes, but losing no time from speed of actual current, and were just eleven minutes from the time we entered until we left the swift water. That we thought a quick run, considering the windings of the channel, following which the distance is fully three miles, though a straight line will measure nearly one-third less. The rift is very swift and crooked, whirling among many and such recklessly distributed boulders that the speed claimed by 'F. P. and E. P. D.' would have been sure death to both boats and men if it had been possible." The official measurements of the Little and Great Foul Rifts are: Little Foul Rift, 768 ft.; Great Foul Rift, 4,620 ft.; distance from head of Little Rift to foot of Great Rift, 1 3/4 mile. These measurements are probably by the straight line, and not according to the windings of the channel. "Great Foul Rift, short distance below Belvidere. Ran down on rafting fresh in May. Length almost a mile and a half from head of Little Foul to foot of Great Foul. Rapidity of water and danger much exaggerated." "That's all right for a spring fresh," said the teamster, who had heard this note read. "But the river is ten feet lower now; and it's the bottom of a river that's dangerous, not the top." Guiteras was the first in his canoe. "Here goes for Philadelphia!" he cried, as he pushed off. "Are there any rapids near us, down the river?" "Listen!" and the teamster smiled. We listened and heard one, the sound coming from the bend of the river half a mile below. It's only a little one," shouted the teamster, as we started. "Keep well to the left, and you'll find a channel. It is a smooth rift." 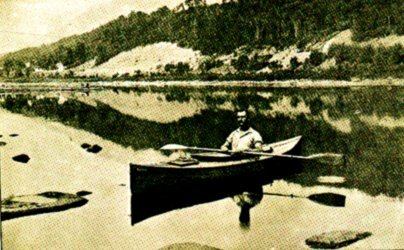 We were three, in three canoes,--Mr. Edward A. Moseley in a stout boat built by Partelow, of the Charles River; Dr. Ramon Guiteras, in a strong Racine; while mine was a keelless, decked canoe, by the best builder in the world, Rushton, of Canton, N. Y. It was two in the afternoon of a glorious day when we started from Port Jervis. After a long, dusty railroad ride, it is impossible to convey the exhilarating sense of freedom and enjoyment which one feels during the first moments in his canoe. To plunge the bare arms to the elbow into the river as you go, and let the cool water curl up to the biceps; to feel the soft breeze on bare head and neck; to be far from the busy crowds in the cities, with all the senses awake to new and fascinating ohjects--the swirl of rapid water, the brown and yellow stones on the bottom of the river, the large, free movements of clouds, the strange flowers on the bank; to grip the paddle with an agreeable sense of power in shoulder and hand; to brace the feet strongly against the foot-rest and feel the canoe spring with the elastic force of the stroke; to shout unrestrainedly to your companions, and hear them shout in return like hearty, natural men; to laugh consumedly with slight cause; and in the midst of all this joyous wakefulness, to be aware of the nearing rapid ahead--to hear its low, steady roar, as if the sound clung to the water; and to be aware also of a new preparation of nerve, sight, and muscle--a purely animal and instinctive alertness--for the moment of rushing excitement into which you are sweeping,--all this we experienced within ten minutes of leaving the gravel bed at Port Jervis, and while the teamster still shouted to us from the shore. We were silent at first, and surprised. It took us some moments to realize that the surprise was delight. The river was not deep--three or four feet at most; but it ran down hill like a hunted hare. There was something quite new in it, too, which I concluded to be the long, wavy green weeds near the bottom, that floated straight with the current like a yacht's pennant in a gale, and by their swaying and glistening in the depths indicated the course and the extraordinary rapidity of the water. "This is superb!" said one. The others echoed the word. Almost before we knew, we were in the rush of the first rapid. We had not carefully followed the teamster's instructions to keep to the extreme left; and we had passed the narrow mouth of the channel. Before us ran an oblique bar of heavy stones, over which the river poured like a curtain. It ran clear across the river, and we found ourselves far into the closed angle. The water on the curtain to the left roared like a heavy surf, and we knew that we could not get over or through. There was no opening between the stones more than two feet wide, and beyond or below was a hundred yards of chaotic rock and roar. We turned and paddled up stream--I might have said up hill. Inch by inch we gained, working with feverish speed, the paddle slipping back in the glancing stream as if it were in air, holding hardly any force. But we climbed the first descent, and steered across to where the channel hugged the right bank. Guiteras went in first; he had not gone up far enough by a boat's length, and as he shot across into the narrow channel, his canoe lurched upon one side, stood a moment and swung athwart stream. He had struck; but before a thought of danger could follow, the paddle was buried, and with a lifting push, his boat slipped over the stone and rushed down the rapid like a leaf. The other canoes followed, avoiding the buried stone. It was a vigorous little rush--about two hundred yards in length, and not fifteen feet in width. The water was deep, but its speed made it rise in a leap over every stone on the bottom, and hurl itself in all kinds of ridges and furrows and springing white-caps. At the bottom of the rift we plunged into a into the heap of boiling breakers, still running like mad. Next moment we floated into smooth water, and turned and looked back at our first rapid with much laughing and congratulation. The rapid, or rift (on the Upper Delaware all rapids are rifts; on the Lower Delaware all rifts are falls; the change beginning, I think, about Easton, as, for instance, Saw-mill Rift, Death's Eddy Rift, Big Foul Rift; and below, Welles's Falls, Trenton Falls, etc.) --the rapid we had passed, on looking back, seemed insignificant in descent and roughness; but we were fairly astonished at the speed of the water, and I think we had a vague consciousness that it would have been no child's play to steer through that channel had it been of any considerable length, and broken by rocks. The teamster had called it "a little one," and "a smooth rift;" what, then, were the big ones? There was no mention at all of this rift in the notes of the canoeman which I had with me. What was the ominous Great Foul Rift in comparison? As we gazed back at the rapid, it receded from us swiftly. We were on the quiet surface of deep water, but going down at the rate of several miles an hour. The current still kept to the left bank, and an odd bank it was,--worth describing, because it continued intermittently quite down to Trenton, where the last rapid on the Delaware pitches the canoeman into tidal water. The bank resembled molten metal that had hardened. It was almost black, a clean, smooth stone, with round puff-holes in it, no vegetation whatever on the steep slope of, say, twenty feet from the water's edge, above which rose a wooded hill, almost a mountain. The metallic bank ended abruptly in the stream, and the deep current alongside ran with astonishing swiftness. I realized in brief time that up to that day I had not known rapid water, continued in a long stream. The Susquehanna rapids are short and sharp descents, followed by slow and gentle reaches, some of which are miles in length. The Connecticut, in a memory of six years' distance, spreads out like a lake, with here and there a log moving alongshore, showing that there actually is a current. The Merrimack was remembered as a very millpond, except on the short descent of Miller's Falls, near Haverhill, and in the powerful tidal rush under Deer Island Chain-bridge at Newburyport; while many lesser streams were quite forgotten in presence of this grand artery which carried us onward almost as fast as we could paddle on slower rivers. I have given too much space to our first rapid on the Delaware, which, we soon found, was only one of scores before us, and a small one--even a "smooth one." But it will save other descriptions; and it gives our first impression of the river. Having run the Delaware from Port Jervis to Philadelphia, we found that this first rapid was singularly characteristic. All the considerable rapids are of a somewhat similar formation,--except the Great Foul Rift, which is unique. The rapids of the Delaware are formed in the main by an oblique line of rocks crossing the river, leaving a narrow channel on one side, or sometimes the opening is almost one-third of the way across, with reefs on both sides. With deep water, say in May or June, when the river is from eight to ten feet higher than it was in the last week of August, a canoeman may run two hundred miles of this incomparable river without striking a stone. But every foot of fall in the stream makes a totally new river; and he who goes down on a freshet in early summer cannot imagine what the river is like at low water in late autumn. The Delaware is a river of extraordinary pitch, the fall from Port Jervis to Philadelphia being nearly 1,200 feet. On that first afternoon we intended to run down to Milford, twelve miles distant, where, we had been told, there was a famous hotel. But we lingered on the way. In the sweltering heat we pulled the canoes ashore and plunged into the delicious water, drinking it as we swam--a sensation for epicures. We lay prone in the rapid stream, our arms outspread, and our faces under water, floating quickly down, and looking at the yellow and white pebbles on the bottom. At last we came to a lovely spot, a soft white sand-bank on the left, the Jersey side, formed by the junction of a bright little river with the Delaware. Every paddle was laid down. Half a mile below we heard the dull roar of a rapid. Here the river was very deep and swift, and not more than eighty yards wide. On the right, a wooded but precipitous mountain iose almost straight from the water to a height of at least 800 feet. From his eyrie far up we had disturbed a white-headed eagle which floated and tipped its great wings above us as it moved slowly down river. The sand-bank was in the angle where the little river fell over a short rapid of twenty yards into the Delaware. The bank was hemmed in by a dense wood. We camped on the sand-bank for the night. One man erected the tent; another cooked dinner; the third went in search of a farmhouse for milk, eggs, melons and peaches--the staple of our food for the next fortnight. While the dinner simmered we had a trial of strength with the Delaware itself, breast to breast. Swiftly we struck across and down the river for a hundred yards, and then turned and faced the stream. Three strong swimmers,--two of the three extraordinary. Moseley, with the over-hand stroke, which sends him about eight feet a stroke in still water, made progress at the rate of about one foot a stroke. Guiteras barely held his own, swimming as if he were anchored; and, watching the bank, I saw that I was actually going down stream. Under such circumstances you can do a great deal of swimming in a quarter of an hour. The sun went down on the left, above the low trees, without cloud or haze. For a long time after its disappearance the upward rays flamed on the face of the great cliff across the river, the red gleam moving higher and higher, and the darkness creeping up the wooded wall like a vast tide. When the line of light had cleared the brow of the cliff the trees above, diminished to a finger-length, blazed in gold and crimson; and then, almost suddenly, the light left them,--rose over them, and was lost in space, and they, too, were swallowed up in the night. "The light that shoots over the heads of trees or people," said Moseley, "might as well not exist." With which philosophic reflection, we spread our rubber blankets on the sand of the tent, over these our woollen blankets; and then, with a big fire blazing a few feet from the tent's mouth, we lay or sat for our coffee and cigars. Throughout our trip this quiet smoking hour, each evening with a strange scene before us, was a most enjoyable part of the day. We slept as if the night were an hour long, and we woke to plunge into the sweet unchilled water. We started without breakfast, hoping to reach Milford and the "famous cook" at an early hour. The miles were long, and the river unendingly broken. It was down hill all the time, rift succeeding rift. Do what we could with careful steering, we struck again and again, and we were in constant danger of smashing boats or paddles. So common became the striking that we coined a word for it--"hung up." And we could not help laughing, when one struck, as we swept past and saw him grimly poling his canoe over a rock, or raising his feet over the gunwale, as he got out to haul her over. For this we had to be always ready; trousers tucked up, and canvas shoes on. It came to be a jesting habit, that when one led into a rapid he would do so with a boastful shout. This was my part, at one time on this second day. I had gone into a rift with much flourish, and, a third of the way through, had been "hung up." Down rushed the others with loud derision, avoiding the bad place. Imagine my feeling of disgust at their selfishness, as I saw their backs, leaving me there. Next moment, in the worst part of the rapid, I saw one of them strike and hold his boat with his paddle against a rock; and a second or two later the other struck just beside him. Who could help smiling? And that moment, by a fortunate lurch, my canoe floated and rushed down toward the two, who were now struggling knee-deep in the stream. They held on to let me pass, and scowled as if my laugh were in bad taste. At ten o'clock we reached Milford, Penn., and climbed the hundred feet of steep bank on which the little town stands. Over the town, all round, rose still many hundred feet of grandly-wooded mountains. The hotel, they told us, was over twelve hundred feet above sea level. The hotel we found to be even better than its report. Ever since starting at Port Jervis, Moseley had kept referring to the beauty of the scenery at Walpack Bend, some fifteen or twenty miles below Milford. He had a camera with him, and his desire to get out and take a view grew on him like a disease. No impatience, or protest, or prayer affected him. "When we get home," he would unselfishly say, "these pictures will be the best part of the trip,"--and he was right. The banks on both sides now rose into mountains, wooded to the top. The river was a series of deep and swift reaches, and then a leaping rift, with a steep descent. In the very centre of one of these rapids, an unusually deep one, my canoe struck on a covered rock and I knew in a flash that she must either get instantly over or be rolled down stream. Thought and act united. I lifted her by a vigorous push, and was whirled down, stern foremost, with my paddle broken. Fortunately, the channel below was deep, though rough and very rapid. To meet the emergency I knelt up, instead of sitting as heretofore, and used the broken end of the paddle as a pole, fending off rocks, and steering occasionally with the blade end. Before I had cleared the rapid I knew that my loss was a gain. The best way to steer a canoe down a rapid is to kneel and use a long paddle with one blade, the other end to be used as a pole. I had a spare paddle in the canoe, a delicate spoon paddle, only fit for deep water. As soon as the rift was past, I jointed this and used it; but when the next rift was heard, laid it aside and took up the broken paddle. The memory of that day is wholly confused with the noise of rapid water. We were no sooner through one rift than we heard another. The names of the rapids were quaint and suggestive: such as Death's Eddy, Fiddler's Elbow, Milliner's Shoe, Sambo and Mary, Vancamp's Nose, and Shoemaker's Eddy. One must use colors, not words, to paint the beauty of the scene that opened before us on our third day, when we ran the upper rapid at Walpack Bend, and floated into a reach of river that can hardly be surpassed in the world. On our right and left the banks were low and richly timbered; and straight ahead, barring our way, about half a mile off, a high mountain, wooded from the water to the crest. The river runs straight to the mountain-foot, and there turns directly to the left. It is not a curve or a sweep, but distinctly a right angle and then, for one mile with the hill to the right and the low farms on the left, and for two miles with the mountain to the left and the farms to the right, the grand stream paces slowly, like a proud horse in the eye of a multitude. Here we had a striking illustration of the power of color. The wooded height before us rose at least twelve hundred feet. The river below was green with the immense reflection. But on the very line of union, where the leaves met and kissed in air and water, was a little flame of crimson, which held the eye and centered all the immensity. It was one small cardinal flower, a plant that grows all the way along the Delaware. The intensity of its color is indescribable. After this superb exhibition of its power, one little red flower against a mile of green and silver, I gathered every day a handful of the lovely blossoms and set them on the bow of the canoe. When one thinks of the marvels of this river, the regret becomes painful that they are unknown to the outer world, that they are only seen by the natives of the scenes and the accidental canoe voyager. The rivers are the veins and arteries of a country, the railroads and roads the nerves and sinews. He has seen the land truly, with its wealth and strength, who has followed the rivers from their sources in the hills down to the tide-pulsating ocean-heart. But the railroads are familiar, the rivers unknown. "Sin writes histories," says Goethe; "goodness is silent." The river affects men in a different way from the road. The dweller by the railroad is keen and quick to trade, and dicker, and undertake. The inhabitants of the river valleys are placid folk; farmers content with their peaceful and laborious lives. "Knows the way to the sea." Here, sitting on a stone, enjoying the soft susurrus in my ears and in the leaves and in the ripples, comes along a country boy, fishing--down the dim arch, walking in the little river, barefooted. "Bushmill Creek is its name," he says; and he knows no more about it--not how long it is, nor whence it comes, But yet a commentator and critic, this barefooted fisher. "How far have you fellows come?" he asked, examining the canoes. "From Port Jervis." And how far are you going?" "Well,"--a long pause--" you fellows must want something to do!" A song sung by some country girls and boys in a boat, passing close to the mountain foot, makes a memory of music and echo as vivid as the gleam of the cardinal flower. They slowly move their unwieldly-looking crooked oars, characteristic of the Delaware--the flat blade set on the oar at an obtuse angle. But this oar, hinged on the gunwale of the flat-bottomed boat, or bateau, is suited to a river of rifts, the bent blade enabling the rower to sweep the shallow water without striking. The river is rich with bass, and the fishers are numerous. Below Walpack Bend, a lady in a boat, excited and joyous, holds up a splendid fish as we pass. "See! I've just caught it!" she says. It was at least five pounds weight. A gentleman in the boat tells us that we can run all the rapids down the river--" except the Great Foul Rift!" Here it was again; and from this time forward, almost every one to whom we spoke warned us in about the same words. Hence grew an unexpressed desire in each of our minds to get away from this croaking rapid; we longed to reach and run it, and have done with it. But we were approaching one of the glories of the Delaware--the most famous and certainly the most sublime--the Water Gap. We reached it unexpectedly. We knew when it was only a few miles away, but we could see nothing ahead but the unbroken mountain range on each side. One mile away, and the range had closed around us in a bight, leaving no perceptible opening for the river. "Where is the Water Gap?" we asked a boatful of fishers, anchored under a bridge. "You'll see it in half a minute," they answered. "And look out! for just round the turn there, you will be in the rapid." We did not need the warning; we were in the quick water already. Looking into the stream, we saw the yellow stones on the bottom fly sternward at an extraordinary pace. The roar of a powerful rapid reached us as we came to a sharp turn in the river; and below us we saw a memorable scene. I do not know the descending angle of that rapid, nor the measure of its fall; but it seemed as if we were on the top of a hill of rushing water, at the bottom of which, less than a mile away, was a vast wooded basin, its green slope broken by two white hotels set on the hillside, but still seemingly far below us. There was no time for admiration, or for anything but steering. We ran down the Jersey shore, close to the rocky mountain foot, in the fastest rush so far. The river plunged from ledge to ledge fiercely; but the channel was deep. At the foot of the fall, we were shot into a whirlpool of yellow breakers that curled up and washed clean over the canoes, drenching all, and almost swamping one of them. We stopped at the Water Gap that night, and sat long on the wide veranda of the hotel, looking at the wonderful scene. The river passes between two mountains, as through a tremendous gateway; and one feels, without knowing, that beyond that imperial portal, the scene must change into something quite new and strange. This we found to be true: the Delaware may be said to have left the mountains when it pours through the Water Gap. Henceforth, its banks are bold, or even precipitous, as the right bank surely is in a wonderful cliff some miles below Reigelsville; but it is a mountain river no longer. In the morning, before starting, we climbed the mountain and looked down on the wild beauty of the Water Gap. From that height the fall in the river was imperceptible; and the rapid that had astonished us the day before looked like a mere shallow brawl. Few people are aware of the force and danger of rapid broken water. To the person who drives or walks along a river, the rapid seems the safest spot, because it is obviously the shallowest. But, as the teamster said at Port Jervis, it is "the bottom that is to be feared, not the top." It is just the same with humanity," says Guiteras, when this thought is spoken; "it is the superficial and hasty people who make all the trouble. Depth of mind is as safe as depth of water." The last word to us from the boat-keeper at the Water Gap was, of course, a warning about the Great Foul Rift. We ran two or three rapids that day that tested nerves and boats, and were exasperated to hear that they were "smooth rifts," and "nothing at all to the Big Foul." In the high heat of the afternoon, we came to a place where a little waterfall leaped down a bank almost twenty feet into the river. The falling water was white as snow. We went under it and enjoyed a glorious shower bath, but found that in the centre the water fell in lumps almost as heavy and hurtful as clay. That day. too, we had another novel and delightful experience. We came to an unbroken reach of river on which the descent was so great that a stretch of two miles before us resembled a coasting-hill of ice. The river was about five feet deep, with a gravel bottom. We let the canoes float, and we followed, with outspread arms and faces in the water, fairly coasting down that wonderful liquid slope. Late in the evening, not finding a pleasant camping place, we settled at last on a tolerable spot, on an island. We were tired, and we soon fell asleep--to be awakened by a shout of horror from Guiteras, over whose hand a snake had crawled! He had flung the reptile from him, out of the tent. After such a start, sleep was out of the question. We lay, however, and tried to rest. But every rustle of the leaves outside, every insect that stirred in the grass, brought a chill and creepy feeling. "I am going to sleep in the canoe," at last said one; and at the word we gathered our blankets and abandoned the tent. If it were not for the danger of straining the boat if pulled ashore, or of catching malaria if it be left afloat, the canoe is the pleasantest and easiest sleeping place. In the morning a swim, a solid breakfast, and an extra careful packing of the canoes. No one spoke of it; but that morning we were each conscious of a particular attention paid to the trim of the boats and the stowing of dunnage. At about eleven o'clock in the forenoon we would reach Belvidere; and the Great Foul Rift was only a mile farther. There was a camp of bass fishers near us, and they came to see us start. They learned our intention of going down without portage, rift or no rift. They did not dissuade us. One of them said he knew the Big Foul Rift, and he gave us precise, too precise, instructions. All I could recall half an hour later was: "Keep to the right when you come to the big white stone--if there's water enough to float your boats." It was noon when we came to the town of Belvidere, and paddled into deep water under a mill. We needed some necessaries for our dinner, and we could buy them here. The school-boys flocked to the bank to see the canoes, and the mill-workers (it was the dinner hour) came down to have a chat. "You are not going to run the rift?" asked one. "They can do it: they don't draw more than two inches," said another. We knew that at least one of the canoes, heavily laden with baggage, and with a heavy man in her, drew more than six inches. We could get no information worth having, except a repetition of the fisherman's word: "Keep to the right of the big rock, two-thirds of the way down,--if you can." "Nobody has gone down the rift for five weeks," said the man who had first spoken. Guiteras was going ashore for the necessaries; and as he stood in his canoe, about to step on a log that edged the bank, he slipped, and pitched head-first into the deep water. We were so used to going into the water anyway, that the other two sat quite still in the canoes, as if not heeding, while Guiteras climbed out and shook himself, in a matter-of-course kind of way. This nonchalance created an impression on the crowd; and shortly after, when we started, the general prediction was audibly in our favor. "Keep to the right of the big white rock, and you will strike the channel," shouted a man as we started. Half a mile or so below Belvidere, we felt the water quicken and sweep to the right--the Pennsylvania bank. We knew we were in the first reach of the rapid that had been roaring for us since we started. There are two distinct rapids,--the Little Foul and the Great Foul,--divided by a reach of safe but swift water of half a mile. From the moment we struck the Little Foul Rift, we knew we were in the grip of a giant. We were as much astonished as if we had never run a rapid before. We shot down the river--each one finding his own channel-like chips; and, with all our careful steering, we grazed several dangerous stones. There was no stopping at the foot of the Little Foul Rift; but we ran with the stream without paddling, and examined the entrance to the Great Rapid ahead. There was no bar or ledge formation here, as in the minor rifts behind us. The rocks stood up like the broken teeth of a sperm whale, irregularly across the river, and as far ahead as we could see from the canoes. Some of the stones were twelve feet out of the water, others of lesser height, and of all shapes; some were level with the surface, and some covered with a few inches of water. These last were the dangers: to strike and get "hung up" on one of these meant certain upsetting; for no boat could stand the rush, and there was no footing for the canoeman if he tried to get out to push her over. But more threatening than the tall rocks, that looked like a disorganized Stonehenge, was the terrible nature of the bed rock, and the broken stones on the bottom. We could steer between the teeth we saw, but we suddenly became conscious of unseen teeth that lay in wait to lacerate the boats under the water-line. The whole bed of the river is formed of a rock that is worn and wasted in a strangely horrible way, as if it were pitted with a hideous smallpox. Round and oval holes are seen everywhere in the rock, some of them as much as two feet deep and three feet across; and the upper edges of these bowls are as sharp as scythes. We saw the process of this singular pitting. Heavy stones are caught on an angle of the bottom and rolled over and over without proceeding, till they wear out these cup-like holes, and are buried deeper and deeper in their ceaseless industry. As the bowl increases in size, it catches two workers instead of one, and these grind each other and grind the matrix till the very heart of Nature must admit their toil, and pity their restlessness. Some of these great stone cups were high out of water, empty and dry; and their round tormentors lay in peace on the bottom. Some were above the surface, but still half full of water that had dashed into them from the rapid. But there was a keener evil than the circular knife tops of these vessels; and it was their broken edges. When the torrents of winter and spring thunder through the Great Foul Rift, whirling and dragging trunks of trees and massive stones down the surcharged channels, the pitted ledges of bottom and bank are smashed like potsherds, the imprisoned stones are released and shoot down the river, and the fractured rock remains to cut the water with irregular edges as sharp as a shattered punch-bowl. We were going into the Great Foul Rift all this time, at the rate of--but who can tell the rate of rapid water? The best canoeman I know says there is no canoeing-water in America over twelve miles an hour,--I think he places this on the Susquehanna, below Columbia,--and that eight miles is very rapid indeed. He may be right; but, were I asked how fast we went into the Great Foul Rift, I should say, at least, at the rate of twelve miles an hour, and, in parts of the descent, much faster. Guiteras went first, but was caught on a covered flat stone in the quick, smooth water; and Moseley led into the rapid, Guiteras, who had floated off, following. I came about fifty yards behind. From the first break of the water, the sensation was somewhat similar to that of falling through the branches of a tree. The river was twisting down-hill in convulsions. We rushed through narrow slopes of ten or twenty feet as if we were falling, and then shot round a rock, flinging the whole weight of our bodies on the steering-paddle. The tall stones ahead seemed to be rushing at us with the velocity of an ocean steamer. All the time we were painfully conscious of the presence of the incisive edges under water, as one might feel the nearness of burglars' knives in the night. If we struck one of these stones on a downward shoot, it would rip the canoe from bow to stern. Moseley steered skilfully, and we cleared two-thirds of the tortuous descent without a shock. A quarter of a mile ahead we saw the smooth water at the foot of the rift. We had crossed the river, and were running down on the Pennsylvania shore. Suddenly, the channel we were in divided at a great white stone, the wider water going to the left, toward the centre of the river, and a narrow black streak keeping straight down to the right. A memory of the warning came to me, "Keep to the right of the big rock,--if you can." But it was too late. A man could not hear his own shout in such an uproar. The white rock rushed past us. The canoes ahead had turned with the main stream, and were in the centre of the river in a flash. Suddenly both canoes ahead were shot out of the channel, their bows in the air resting on a hidden rock; and the current, just then turning a sharp curve, swept by their sterns with a rush. Fortunately they were out of the stream, driven into an eddy, or that had been the end of them. I had time to profit by their mishap. 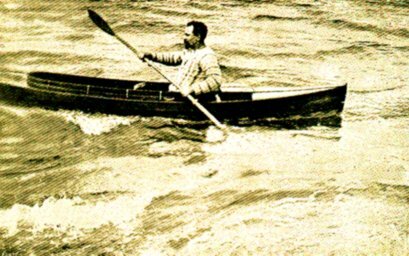 Kneeling in the canoe, using the long-handled paddle, I rounded the curve within a foot of the grounded canoes, and fairly leaped downhill on a rounded muscle of water. In the rush, a thrill swept my nerves--and another--as if twice I had touched cold steel. I found later that my canoe had twice been pierced by the knife-like edges under water. Before I realized it, the end had come, and the canoe shot across the river in a sweeping eddy. The Great Foul Rift was behind me. A fisherman on the bank had been watching our passage. "You ought to have kept to the right of that stone," he shouted. "See, there's the channel!" And, looking up, I saw it, straight as a furrow from the big white stone, keeping swift, close to the Pennsylvania shore, unbroken, and safe. Had we kept in this straight way the Great Foul Rift would to us have been no more than an exaggerated name. The grounded canoemen pushed free, and were down in a minute; and then we went ashore, and while Moseley photographed the Great Foul Rift, the others plunged into the delicious water, that seemed too peaceful and sweet ever to have been violent and brutal. Half a mile below the Great Foul Rift, we came to the pastoral scene of the voyage, par excellence. It was ideal and idyllic--sunny and varied as a Watteau painting. It was not great or grand in any way; but simply peaceful, pastoral, lovely. It was a sloping hillside, of two or three farms, rising from the river. There were low-roofed homesteads, smothered in soft domestic-looking foliage. A round-arched stone bridge spanned a stream in the foreground. Cows and horses stood in the shadow of the trees in the fields, and a drove of cows stood in the river, the reflection as distinct as the cow-like Herrick's swans, that "floated double--swan and shadow." Dark woods framed the scene on both, sides and on top, children's voices at play filled the air, and a dog barked joyously, joining in some romping game. We laid our paddles on the canoes in front of us, and floated a full mile through the lovely picture. It can never be forgotten. In its quiet way, nothing equalled it on the whole river. "Photograph the place," I said to Moseley. "No," he replied. "It is too good for any thing but memory." And then followed a rare picture of another kind, or rather a piece of statuary. We had stopped to cook and eat a noble bass. We sat on the bank, near a cosey farm-house, which nestled in trees a little withdrawn from the river. The farmer, a young, roughly-clad man, with laughing bright eyes and a brown, good-humored face, came down the shady road, riding a great draught-horse, and leading another. Following him, were his two little sons, perhaps ten and twelve years old. He chatted pleasantly with us, while he unlaced his heavy boots, and undressed. "Are you going to swim?" asked Guiteras. "I am going to wash my horses," he said. Just then he pulled his gray woollen shirt over his head, and stood naked beside the horse, preparing to jump on his back. We fairly shouted with admiration, the man was so superbly handsome, and so marvellously muscular. He smiled pleasantly, as if not surprised, jumped on his horse and rode into the deep water; his two yellow-haired boys sitting on the bank, with their hands clasped in front of their legs, watching their father with profound pleasure. We were accustomed to seeing athletes in training; but none of us had ever seen the equal of this man. He swam his horses out in the deep water for a quarter of an hour, riding like a Centaur, every muscle on his lithe body sinking, gathering, contracting, disappearing, in the most astonishing way. He was not a tall or heavy man. When dressed, he was almost common looking. But never a Greek or Roman gladiator, in life or marble, was more beautiful or more powerful than that young Jersey farmer. When we came to float the canoes, after dinner, I saw, with dismay, that mine was almost half full of water. In a glance, I realized the meaning of the quick tremors that had chilled me in the last rush of the Great Foul Rift. The canoe had been struck twice under the water-line by the keen-edged rocks. I feared that the end of my trip had come; but we emptied the water and found that the leaks, which were clean-cut, as if by a knife, had swelled, and almost closed. Easton was a dozen or fifteen miles away; and when we got there, Moseley thought he could patch the canoe with resin and linen and make her water-tight. But it was a heavy paddle, though the stream raced downhill. One of the cuts was bruised afresh, in a rapid about four miles above Easton, and the water spurted into the canoe. It was dark to blackness on a Saturday night as we paddled down to Easton. We had been told of a strong rapid just above the city, but we could not see it; we could only hear it, the roar doubled by the night and the imagination. We had run two or three small rifts in the dusk, and had escaped pretty well; and there was nothing for us but to venture again, in the dark, for nowhere could we find a place to land or leave our canoes. Heavy as a sick animal, my poor little water-logged boat wallowed along. To strike now was doubly dangerous, for her weight would smash her, bow or beam. The other canoes went ahead. We had been instructed to keep "on the Jersey side of the island." When we entered the rapids, we only paddled for steerage-way. The men ahead kept shouting to me; but, when the rush of the fall came, I was too far to the right, and I brought up heavily on the very outermost stone of the reef. The canoe was so firmly fixed, that I could have stayed there all night, by sitting quiet. I tried to push off, but could not. I tried to get out; but the stone was sloping, and offered no footing. The water, visible only for a few feet, like a flood of ink, ran with tremendous force on both sides of the stone. The other canoes were out of hearing; and the night was as black as the inside of a cave, with the bright, electric lights of the city, a quarter of a mile away, set upon what seemed high cliffs above the river. However it was to be done, I must get out, and ease the canoe off the rock. This was one of the minutes in which the disgusted canoeman resolves to give up the sport. If I pushed her over, down stream, I could never hold her to get in: she must be pulled back, and then pushed round the stone. Slowly and cautiously, I got out, and into the water behind the stone, which was almost waist-deep. When the canoe was pulled back, I got in, with some trouble; and a few minutes later joined the others at the end of the rift. Then began a hunt for a landing. We found that, in the city of Easton, there is not a single landing-place where we could put up our boats for the night. At last we were directed to a place where boats were kept on the bank, on the Jersey side; and there we found an obliging and interesting man named John Horn (the boys called him "Tippy" Horn), who allowed us to carry the canoes up on his rocks, and who stored our baggage, and then rowed us across to Easton. He was an old river-man; and he said that he had never seen the water so low as it was then. He was a type of the calm, polite, and intelligent common people we had met everywhere on the Delaware. He spoke so slowly, and enunciated his syllables so clearly, with his r's burring strongly, that you listened to his sensible sentences with odd pleasure. That night we stopped at an excellent hotel in Easton; and, while enjoying the pleasant rest of room and bed instead of tent and sand, we received a visit from two genial canoemen, who were on a pedestrian tour through the mining districts, and who recognized our names on the register. One was Mr. Kirk Monroe, then president of the New York Canoe Club; and the other, Mr. Rogers, the artist, whose clever sketches in "Life" and other periodicals have made his reputation national. We found the citizens of Easton suffering from the intolerable system of the "Law-and-Order" fanatics, who controlled the town, and who had established a system of secret espionage of which the police were used as the tools. Next day, on the rocks, assisted by Mr. Horn and Mr. Horn's two or three children, and pleasantly watched by a sitting ring of smoking foundrymen, Moseley heated his resin, and patched the damaged Blanid from stem to stern. We found that the sharp edges of the Great Foul Rift had cut her as a bravo cuts his victim. When we floated her, she had anything but a racing bottom; but she was as tight as a drum. Below Easton, opposite the great rolling-mill, we saw a sight of striking effect,--a multitude of men and boys--perhaps a hundred altogether--for swimming, and stripped standing on the high bank. They were outlined against the sky; and as we passed them a hundred yards off, they seemed models of lightness and grace. It was probably the great number of white bodies that made the scene so strange. Such peaches as we lived on that day--such cantelopes, such melons! Such an island as we camped on, with clean sand as soft as flour! Such a spring pouring out of the mountain across the river, the water as cold as ice, and as clear as liquid diamonds! We enjoyed it with the keenness born of regret; for next day one of our party would have to leave the river. At Reigelsville, next day, a little Jersey town on a high bank, Moseley boarded the train with his canoe. The other two proceeded; but it was lonely for a day or two, and we sadly missed the strong canoeman and the cheery companion who had left us. A few miles below Reigelsville the river makes a dive down hill, without breaking, so that we seemed to be on a level with the tops of trees growing on the bank a mile ahead. At the foot of such a decline, we heard the growl of a rapid, and found a division in the river, formed by an island. We kept to the left: we ought to have kept to the right. With a few touches, I got through but Guiteras was "hung up" in the worst part of the rapid. He tried all ways to get off without leaving the boat; but he had to come to it in the end. And a dangerous time he had for a few minutes. The water was deep, and the powerful current swept the boat against his body, and nearly upset him, he had hard work to hold her back, and get in without capsizing. Then we came to one of the noblest features of the whole river. On our right, rising sheer as a wall from the water, was a cliff, which must be several hundred feet high. It was formed of layers of rock, each layer perhaps forty or fifty feet deep, and each differing a little in color from the others, so that it looked like a vast storied building. On the narrow ledge at the foot of each layer, trees and shrubs grew, so that the whole face of the cliff was softened with foliage which was so feathery that still the entire wall was visible. In places it was like the outer barrier of a mighty fortress; and in others there was an absolute likeness to artificial masonry. This majestic cliff ran for perhaps a mile, and then ended abruptly in a soft green hillside of cultivated fields. But our last rapid had started the leaks in my canoe, and I was bailing every few hundred yards. As the evening was closing, and it threatened rain, we resolved to carry the canoes into the canal, get aboard a canal-boat, and mend the broken Blanid. The tow-path was only a hundred yards from the river. A hearty canal-man made us welcome on his boat which had a hundred tons of coal on board. His name, he told us, was "Johnnie Curran, from Bristol, down the river." His mate was a small, foxy man, called "Billy," who spoke and walked like a paralytic; but a civil fellow when he got a little present. "Johnnie" Curran was about thirty-three years old; rather below middle stature, but strong and active, with a stern face, like a fighting man; but with a merry eye and a smile in keeping, so that his features were lit up with constant good-humor and good-nature. He had lost two front teeth, and there was a deep scar on his forehead. Everyone knew him on the tow-path and the canal. He was constantly hailing some friend, man or woman, by familiar names, or returning like friendly salutations. He had been canalling "twenty years, like his father before him." He had never known so poor a year as this for canalmen. But, poor as he was, he threw a loaf or something else to every poor tramp we passed on the tow-path. He was called, and he called himself, "Johnnem." In the night (we slept on his boat, which was tied to the bank) we heard passing hails "Who are you?" "Johnnem." "Hello, Johnnem; hope you're well!" A memorable incident occurred while we were on Johnnem's boat. We passed a canalside inn, where men and mules are housed. The landlord, an old canaller, sat at the door, and hailed us warmly. "Who did you have over Sunday?" asked Johnnie Curran. "Oh, we had a good time--a lot of the right sort. We had Barrett, and Patterson, and Alleghany--and a lot more; and then--we had Mike!" "Mike! Well, then, you did have a good time. Where was he going?" "Went down to Lambertville, last night." "Good by!" Then Johnnie told us what a "good fellow" Mike was, and how popular on the canal. We soon had evidence to that effect. A boat, passing, entertained us with an account of "a great time" with Mike the night before. "No," sulkily; "but he was up at Steele's." "Don't care if he never comes." "Oh, yes you do. Good-by, Julia." "No, I don't. Good-by Johnnem." Pause of moment. "You needn't tell Mike I said that." "No fear, Julia. I'll tell him to come up Sunday." And Johnnie Curran laughed low to himself, as if he knew the ways of womankind. It was a dismal drizzly evening, and we had to go along till ten o'clock. Then, at Lambertville, we were to tie up till morning. As the night grew the rain increased, and at ten it was a steady downpour. We were grateful for the shelter of the stifling little cabin of the canal-boat, where "Billy" snored, and "Billy's" dog had convulsive dreams, in one of which he plunged over Guiteras, and scratched his face. It was about five next morning when we started. I was half asleep in the cabin when I heard a man shout from the tow-path. "Johnnem, did you hear about Mike?" There was something in the man's tone that made me sit up and listen. "He's down there on the lock--drowned!" "God!" hissed Johnnie Curran, as if he had been struck by a missile. " Drowned, you say?" "Dead! We took him out of the canal last night. He fell in comin' aboard. Poor Mike!" When we came to the lock, Johnnie Curran jumped ashore and joined the group of canal-men, who stood near the body. They moved aside to let Johnnie see; and he stood with folded arms a full minute looking down at Mike. Then he drew a long breath, and turned away, rapidly brushing his eyes with his hand, and came aboard. He went on with his work without a word, though it was obvious that the dead man had been an old and close friend. We crossed the river in Johnnie Curran's boat, and left him soon after, carrying our canoes down to the river. Welles's Falls, at Lambertville, had not water enough to float us through. The run before us was about ten miles to Trenton, and the stream was swift. It was a perfect afternoon, clear, warm, and calm. The scenery above Trenton is surprisingly beautiful, though there is no elevation higher than the tree-tops. It was a superb open picture of river and reflection, wood and cloud, with the city spires in the distance seen under the square openings of two extraordinarily-handsome bridges. It would be difficult to name, in the world, a more beautiful opening to a city than the four miles of the Delaware above Trenton. "The Trenton Canoe Club" was the legend printed on a boat-house under the shadow of the city bridge; and there we stopped. The house was closed; but we went up to the genial toll-keeper of the bridge,--a venerable man, with a face like George Washington, and a manner to equal it,--who stored our traps and directed us to the hotel. The old man pointed out the difficulties of Trenton Falls, below the bridge, and said that he had hardly ever seen the water so low. "I'll go with you myself, to-morrow!" said the courteous veteran; "I'll take a boat and show you the way down the falls." Next morning he was "as good as his word;" but we had with us the president of the Canoe Club, who ran down the intricate channel of the falls, readily and pleasantly chatting all the while. He was in a light canoe, which he handled splendidly. "A few years ago, before we began canoeing here," he said, "every one dreaded these falls. Nobody ever ran them but the lumbermen. Now we come down in our canoes for fun, and drag the boats back alongshore." At the bottom of the falls, which are more portentous in name and aspect than in descent or velocity, we entered tidal water. No more rapids or rifts to Philadelphia, or the sea. The kindly Trenton canoeman left us with a manly grip that was pleasant to remember; and, with the wind and tide against us, we started for Philadelphia, forty-five miles away. Below Trenton the Delaware is uninteresting for canoemen. We were so used to swift water that we seemed to be anchored while paddling under adverse circumstances. We stopped at Florence that night, and next day shipped our canoes on a river steamer, and ran down to Philadelphia. Looking back, we salute the Delaware with love and admiration. It has filled our minds with memories and pictures to be cherished for a lifetime. Noblest of rivers for canoemen, but only for those who come before the middle of July. In the freshets of May and June, a run down the Delaware must be a revelation of joy. Then, not one rock of all that beset our way would be visible or dangerous. We came down a depleted vein: in early summer the Delaware is a full artery. But with all these drawbacks, on our list of canoeing-rivers we must give the first place to the Delaware.